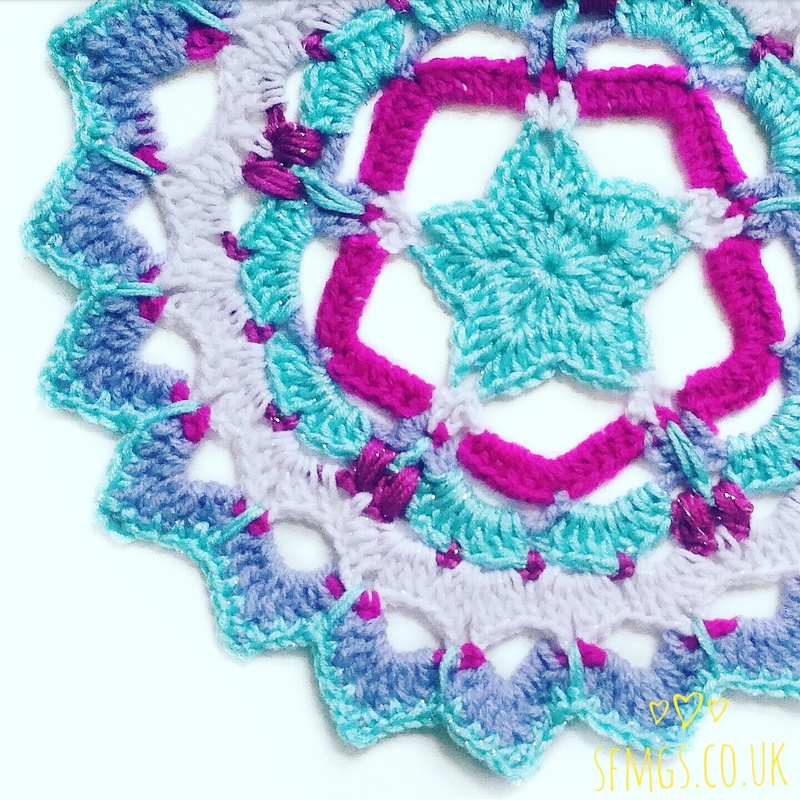 Make a festive Christmas themed Star motif mandala using simple crochet stitches with this week's quick and easy free mandala crochet pattern. 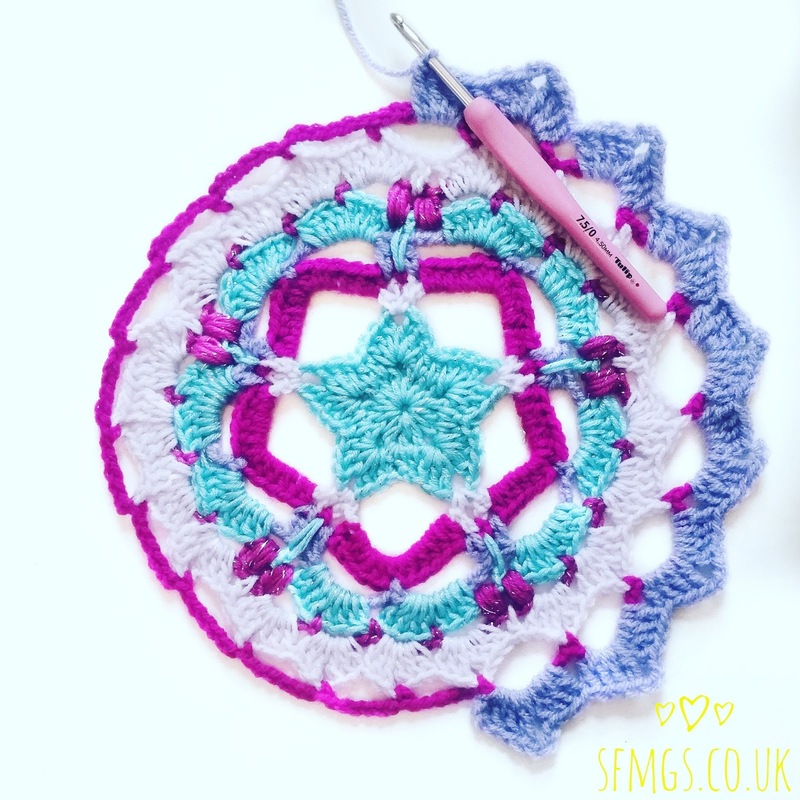 It's another festive design for this week's Monday Mandala, this time with a gorgeous sparkly star in the centre and pretty icy colours. 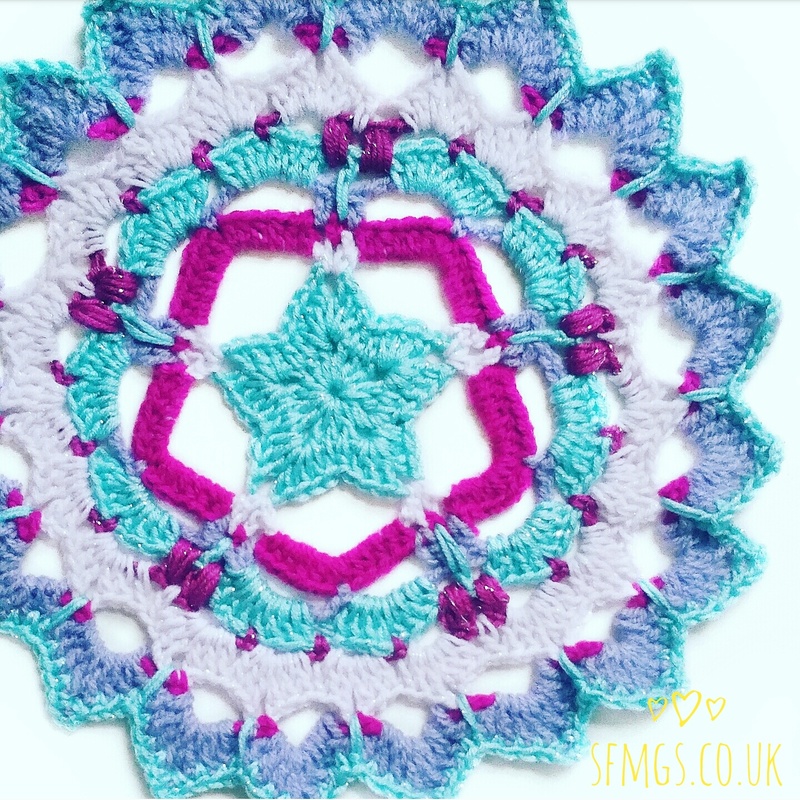 I used two different sparkly yarns, DK and a 4.5mm hook for this crochet mandala, Hayfield Baby Sparkle is the blue and silver and is a silky-cotton type yarn and the very very pale lilac is Sirdar Snuggly Pearl DK which is just soo soo beautiful! I really can't wait to make a cardigan with it! SP-3 = spike stitch over 3 rows: spike stitch is an elongated tc or htc. 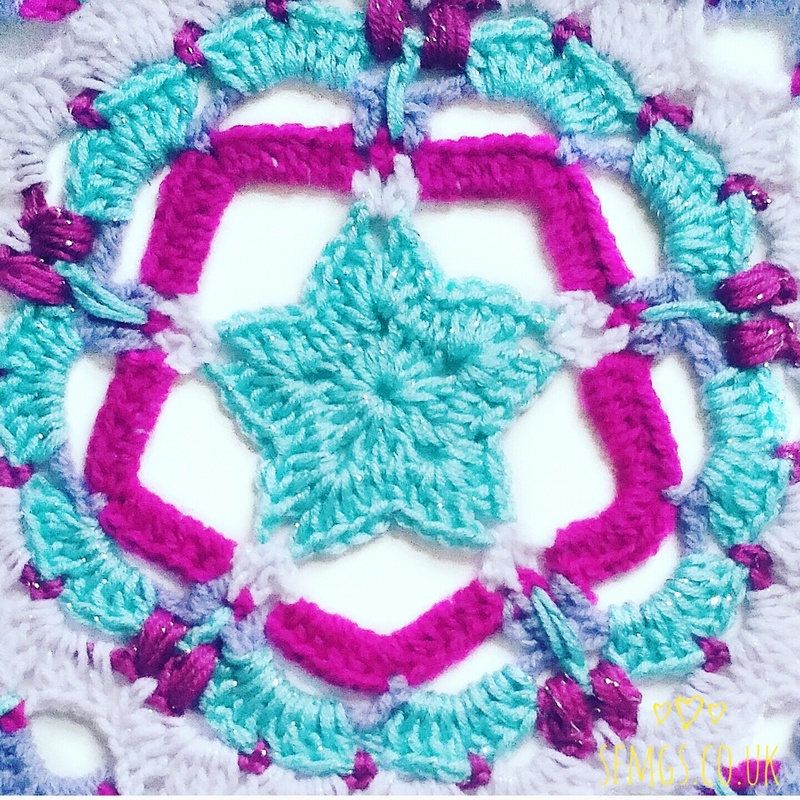 For SP-3, instead of inserting your hook directly into the row below, yarn over and insert the hook into the 3rd row below and complete the stitch. Repeat [ (htc into next 2 st sp, (3tc, ch3, 3tc) into ch-2 sp] to end. NB: End with (3tc, ch3, 2tc) . Join with ss and FO. R3: Join new yarn into any ch-3 sp. Ch 11 as 1st dc (US sc) plus ch10. (dc, ch4, dc) into next ch-3 sp. Repeat [ ch10, (dc, ch4, dc) into ch-3 sp] to end. Join with ss and FO. Repeat [ (12htc, ch1) into ch-10 sp, (dc, ch1) into ch-3 sp] to end. Join with ss and FO. Tc (US dc) into next ch-1 sp. Ch6, miss 5 st sp and dc (US sc) into 6th. Ch 6. Tc (US dc) into next 2 ch-1 sp. R6: Join new yarn into any ch-6 sp to the left of R5 tc (US dc). Repeat [ (8tc), (8tc), SP-2] to end. Join with ss and FO. R7: Join new yarn into sp to right of any R6 SP-2. Ch2 and make puff st into same sp. Ch1. Puff st into next st sp. Ch4. Repeat [ puff st, ch1, puff st (ch4, miss 3 st sp, dc) 4 times] to end. Join with ss and FO. R8: Join new yarn into any ch-4 sp next to a puff st.
Ch3 as 1st tc (US dc)(2tc, ch2, 3tc) into same ch-4 sp. (3tc, ch2, 3tc) into next 3 ch-4 sp. Tc (US dc) into ch-1 sp. R9: Join new yarn into any ch-2 sp. Ch7 as 1st dc (US sc) plus ch6. R11: Join new yarn into any ch-2 sp. Ch 4 as 1st dc (US sc) plus ch3. Dc (US sc) into same ch-2 sp. Dc (US sc) into next 3 st sp. SP-3 into R8 ch-2 sp. Show me your version on Instagram by tagging me @setfreemygypsys0ul or using the hashtags #SFMGS or #sparklestarmandala. 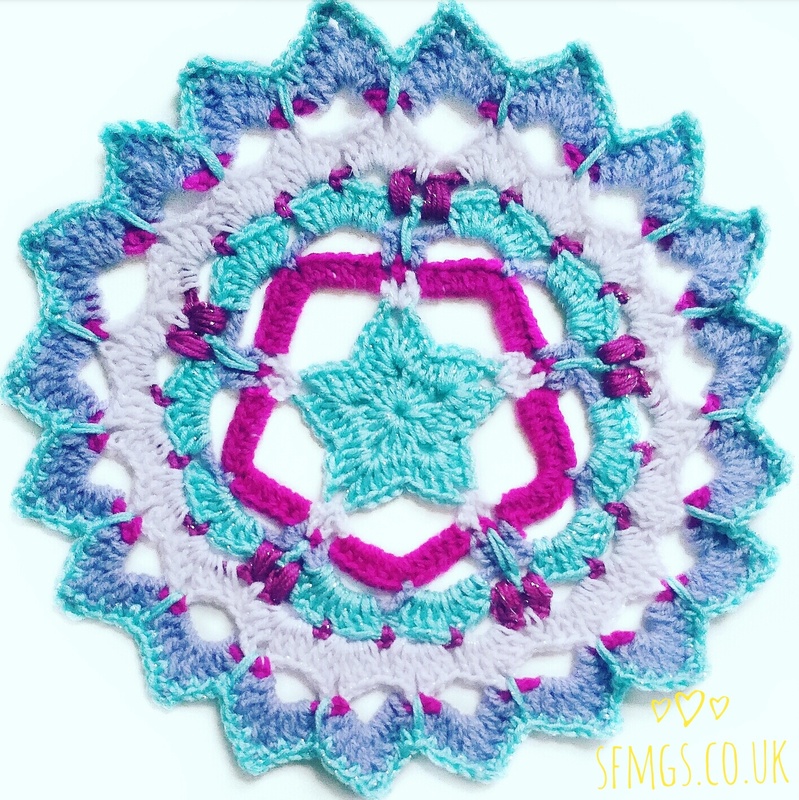 And don't forget Issue 74 of Mollie Make is out now! 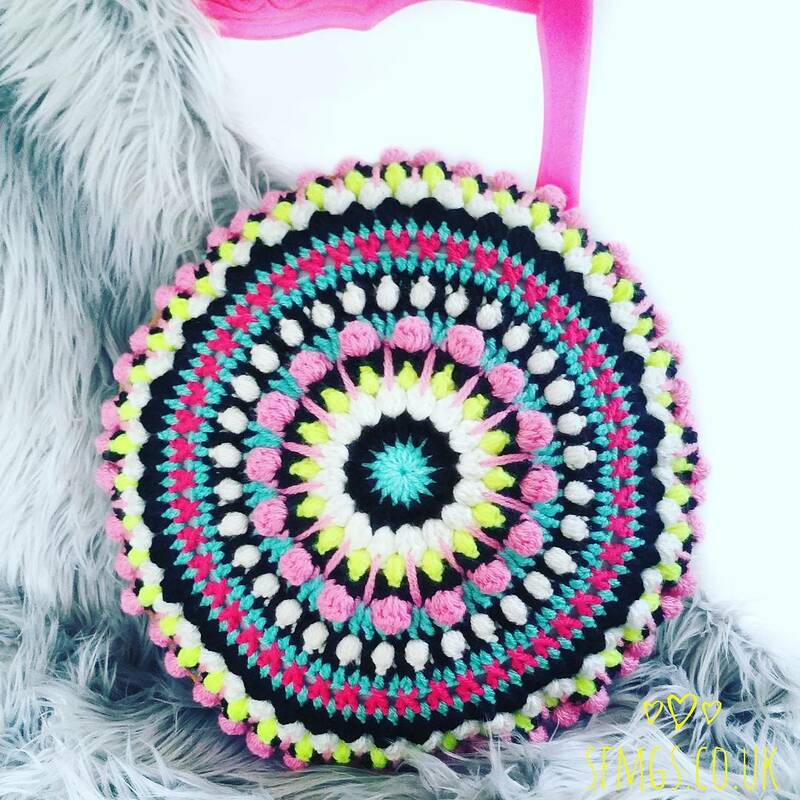 Featuring the SFMGS Colour Clash crochet mandala cushion... eeekk! !